The first part of your Tweet should be around 90-100 characters. This could include a call to action (e.g. ‘see more‘ or ‘learn more‘, or a question – both of which increase the likelihood of someone engaging with your tweet. 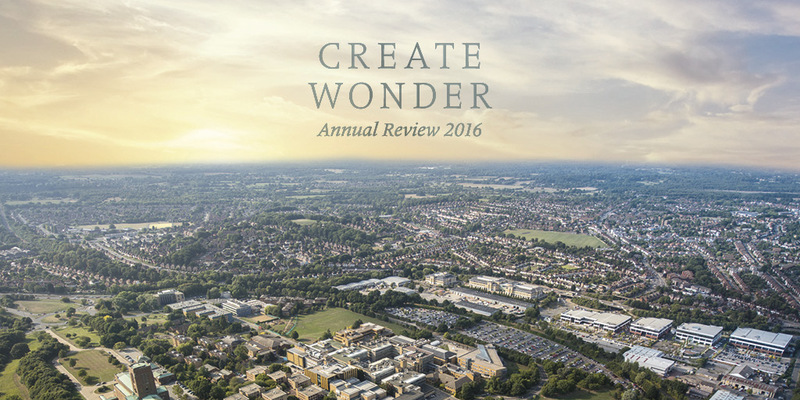 When you’re tweeting about the Annual Review, don’t forget to include the hashtag #SurreyInReview. Hashtags are a way of grouping related tweets together, and also increase the likelihood of someone beyond your following seeing your tweets. 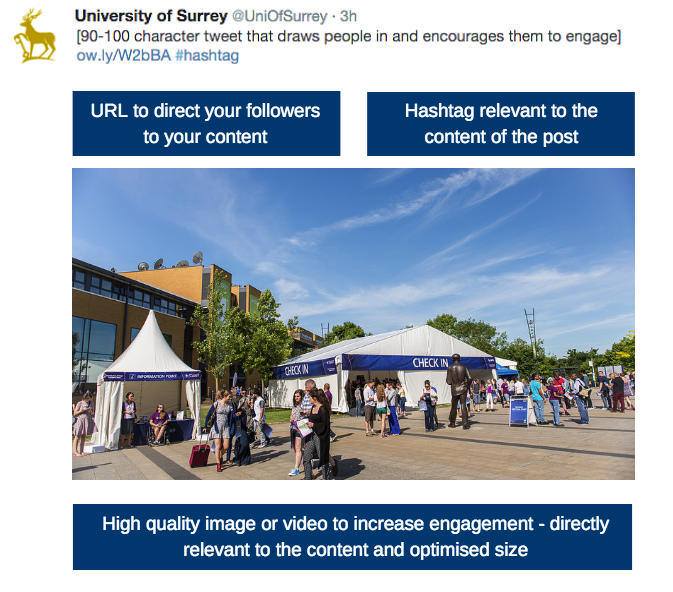 When you’re posting on Twitter, you can also mention the University (@UniOfSurrey) or the relevant department accounts. This could also potentially increase the engagement and reach of your tweets when other users search for the University accounts. In most cases, tweets that include an optimised, relevant image have been found to dramatically increase engagement – sometimes by up to 150%. This means that your post will be more likely to receive retweets, likes and link clicks. Feel free to download/save the image at the top of this post for use on social media! Although it won’t save you any characters, URL shorteners are a way of making your tweet look neater and less like spam. They will also allow you to easily monitor how many times your link has been clicked. Popular examples include ow.ly or bit.ly. If you want to see how your tweet performed, you can check your Twitter Analytics dashboard. LinkedIn is a professional orientated social networking site, currently supporting 300 million+ members. It is a fantastic way to build and engage with your professional network as well as access knowledge, insights and opportunities. The easiest way to share on LinkedIn is through posting an update. When you log on, you’ll be presented with the options below. If you choose to ‘Share an update’ this will appear in the news feed, as it would on Twitter or Facebook. As with Twitter, shorter headlines work best, and asking a question or adding a call to action such as ‘discover more’ can increase engagement. Once the link preview has appeared, it is possible to delete the URL itself but keep this clickable preview. This will serve to make your post look more polished and professional, as well as not detracting from your post text. Another way to achieve this would be to shorten your link, as suggested with Twitter. Are you part of a LinkedIn group that would find the Annual Review interesting? You could share this content with them. This is particularly relevant if you or your subject area are featured highly in the Annual Review. Finally, if you are really invested in sharing the Annual Review and your part in making it happen, you could publish an article (or blog) on LinkedIn. If you select ‘Publish an article’ from the options shown in the image above, this will provide you with the option to write a long-form post. Unlike updates, these posts are often viewed by a far wider audience and can help place yourself as a thought-leader. You can find our tips for creating a successful blog post, here.